It's rare for an enduring market leader performing this well to trade this conservatively. Walt Disney (NYSE:DIS) is one of the most powerful media conglomerates in the world. Made up of dominant and enduring media networks and brands, very few stocks have staying power like this one. Yet worries about Disney's ability to adapt to a rapidly changing media landscape have the stock trading at a conservative valuation, giving investors a good entry point. Here's a close look at Disney stock, and why I'm betting now is a good time to buy. Data for table retrieved from Reuters and Yahoo! Finance. Table by author. A quick look at some of the raw facts for Disney stock highlight a healthy company with increasing revenue and EPS. In the trailing 12 months, for instance, Disney's revenue and EPS are up a meaningful 9.1% and 15.7%, respectively. In addition, it's clear from Disney's price-to-earnings ratio that the stock trades conservatively. 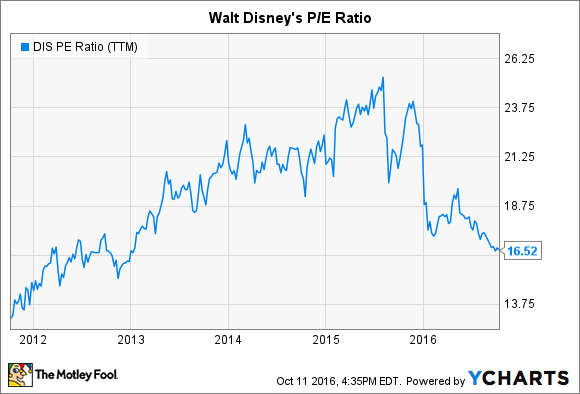 Not only is a P/E ratio of 16.5 reasonable for a company with Disney's recent growth rates, but it's arguably low when viewed in conjunction with analyst expectations for EPS. Over the next five years, the consensus analyst estimate for Disney's average annualized EPS growth is an impressive 10.7%. Further, Disney stock looks attractive as a dividend investment. Its dividend yield of 1.5% may not be substantial, but the dividend has plenty of room to increase in the future; Disney's annual dividend payments currently amount to only 25% of its earnings. Why is the stock trading lower? With financial performance and valuation both looking good, what gives? Why has the stock declined about 13% in the last five months? There seem to be two key narratives suppressing Disney stock's valuation. First, there's uncertainty surrounding how well Disney will manage the changing landscape of paid television subscriptions. With the rising popularity of services like Time Warner's HBO NOW, Netflix, and Hulu, which are decoupled from basic pay-television services, it's not clear Disney's media networks' segment will be able to maintain the premium pricing power and subscriber loyalty it currently boasts at cable networks. If consumers transition to decoupled, Internet-based television, investors are worried Disney's media networks may see lower revenue from decreased pricing power or even fewer subscribers. And Disney's recent slight decline in media networks operating income between the third quarter of 2015 and the third quarter of 2016 -- from $2,378 million to $2,372 million -- doesn't bode well for Disney's ability to manage this transition. With media networks accounting for a whopping 53% of the company's total operating income, it's easy to see why the segment's growth headwinds, and investor uncertainty about the segment's future, may cause some concern. Second, much of Disney's recent success has come from its studio entertainment segment, which isn't viewed as a sustainable and predictable source of operating income. Blockbuster films are simply hard to predict. Studio entertainment operating income soared 62%, year over year, in Disney's most recent quarter and is up 61% in the trailing nine months compared to the year-ago period. If this segment's growth stalls, Disney's overall revenue growth could stall, too. Despite investor concerns about Disney's ability to manage a changing television environment, I believe the stock's conservative valuation more than prices these risks in. Bearish narratives don't fully appreciate the sustainability and long-term upside potential of the underlying networks and brands that make up Disney's business. Walt Disney World. Image source: Walt Disney. Disney's media networks segment, for example, is driven primarily by ESPN -- the undisputed domestic champion of sports television. And Disney's other segments -- parks and resorts, studio entertainment, and consumer products and interactive media -- are backed by brands like the world-class Disney brand itself, Pixar, Marvel, and Star Wars. These aren't your average brands. Sure, a price-to-earnings ratio of just 16.5 isn't exactly dirt cheap. But it's a nice entry point for a world-class company like Walt Disney -- and it's low enough to account for an overhyped bearish narrative about Disney's ability to navigate a changing media landscape.